The thing is thanks to Henshin Grid, I have found out that Goseiger is really having mecha overload. I think this is the combination of Hyper Gosei Great with the Knight Brothers. It's pretty gigantic if you ask me. 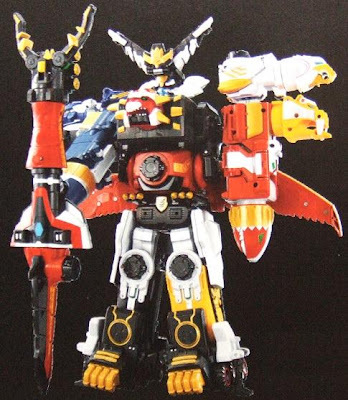 And this is Wonder Gosei Great combined from five mecha namely Gosei Wonder, Gosei Bird, Gosei Alligator, Gosei Elephant and Gosei Kabuto. When I saw Shinkenger, what really fascinated me was this weapon in Shinkenger known as the Rekka Daizantou. I kind of wonder if the prop is made of really light materials seeing that both Tori Matsuzaka who plays Takeru Shiba and his stuntman Hirofumi Fukuzawa somehow could draw it. But if we're to talk of real metal, it would be very hard to draw it and it takes a lot of strength to draw such a heavy weapon. Due to its size, the prop never used real flames for a flame sword scene. Just common sense judgment- look at how the flames engulf the whole blade and it's way more difficult to draw it than just using the samurai. If they wanted more effects, then CGI flames would have been the answer since real flames would be way too risky. In Bioman, the use of real flames won't be as hard as the flame sword (with real flames) move above. These Pink Rangers Are Bad Cooks! I'm just kind of thinking how funny it is with Goseiger's next episode in mind, now there are three pink rangers who can't cook. I just find it funny while Kaori Rokumeikan can cook (and it's edible even if she's not really that good), these non-rich girls can't cook at all! Sadly these type of characters are yet to exist in Power Rangers. Yuuri/Time Pink- I guess her tough attitude makes her a bad cook. One episode featured where she had to take care of a baby and cooking was her weakness. Too bad though Judd Lynn didn't put this element in her PR counterpart Jen since Power Rangers is meant to be a lighter series than Super Sentai is with RPM as the exception. The thing is Goseiger 20 is kind of a J-drama thing for me. So what's the point? Well the thing is the Goseigers decide to help a teenager named Takuya who's desperately in love with a girl. We see the Goseigers use their invisibility powers outside of their suits to hide. However with Datas, their cover is easily blown when their morphing devices ring. Unfortunately the Yuumajuu have launched their own plan using Pesaranza of the Keseran-Pasaran who Makuin sends to devour love from people, which is however kind of common. It wasn't like as if it didn't happen with previous Sentai entries like Jetman or Turboranger. Well I believe these pictures are also worth posting. Enjoy! Rin Takanashi and Suzuka Morita in rather lovely outfits. I hope Rin Takanashi isn't a horrible cook like her character Mako Shiraishi is! The Shinken Boys with a wacky photo of them with a fruit in their mouth. Funny! I just hope this isn't Mako's cooking! Ha ha ha! I wonder what this picture was? Suzuka Morita with a Dice-O Arcade Machine. Another lovely Rin Takanashi photo. Ling pointed out that this was her in Intramuros, Philippines. Hopefully Shinkenger will show in the Philippines. Here are some fun Shinkenger photos I found. Hee hee. An out of scene wacky shot. I wonder where this is? I think they're shooting for something. These costumes just look marvelous for a photoshoot. In their standard clothes in Shinkenger. Genta's the funny one as usual. Another team wacky shot. A behind the scene post maybe? Tori Matsuzaka with a schnauzer. Is this his pet? Maybe it is. Looking really good in their jackets. Shinkengers reunited? Maybe. Like the color of Rin Takanashi's scarf. I think this kid may be Tori Matsuzaka's younger brother. The Shinkenger cast with their plastic weapons on stage. Is this after a show? Another stage show. Ah they're promoting their DVD. 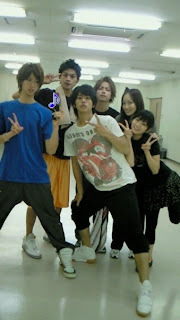 Takeru with some fans maybe? Hmmm... I wonder who these lively ladies are? A behind the scene wacky shot of the favorite shipping. Are they in a relationship in the real life? This image above is from Super Sentai Images and well, I kind of thought about it that ever since Megaranger vs. Carranger, it seems the Sentai universe is being retconed into being canon probably even with the Kamen Rider universe but to Toei's official word, it's a fan decision since they don't intend to make it canon, plus I think they respect the imagination of fans. Two red rangers together. I honestly think that Alata pales in comparison to Takeru. I will watch Shinkenger any day over Goseiger but I'll definitely watch Dekaranger any day over Shinkenger. LOL. 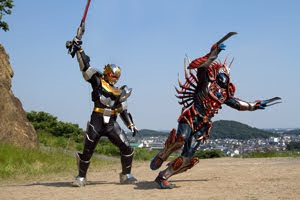 Carranger vs. Ohranger- Carranger was a funny series compared to Ohranger which was more serious. 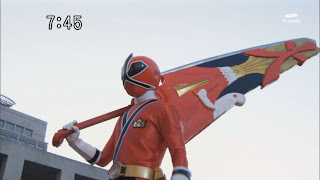 Goseiger epic 19 is full of exciting new action. In this episode, Bladerun seeks to exploit the use of Bladerun's rather awesome power. He reveals himself to be a more competent villain than Mons Drake ever was. Also, I like the Yuumaju so I hope they don't get written off too early. This episode develops a relationship between the Goseigers and Gosei Knight. The monster of the week is Giemuro of the Kappa. He is a Kappa monster that uses sumo wrestling and he's Bladerun's latest asset to winning. He plans to turn humans into the mischievous Kappa. In some Anime, however Kappas were not always evil. This episode also featured a father-daughter relationship just in time for father's day. Kanako was kidnapped and the Goseigers must go after her. Again something about these guys make me feel Saban will do better in adapting Goseiger than Shinkenger IMO. There was the Shinkenger and Decade crossover which happened in episode 24-25 of Decade NOT in Shinkenger. So it was kind of a cross between worlds. Hmmm... it'll be hard for fans in their imagination to fit in the Kamen Rider Universe into the Sentai Universe for any fan-fiction Toei allows them by making both universes officially up to fan's imagination. It's not the first time that Kamen Rider was mentioned. If you can remember the Goranger vs. JAKQ movie, Shoutarou Ishinomori intended that his Sentai warriors be in the same universe as Kamen Rider. However as time passed, it wasn't official and fans were left to speculate how they operated within the same universe. I had the Takeru and Momoko fan pairing. Why? Well it had to start with my ignorance believing that Ial died frozen without knowing that their people can survive extreme temperatures (hee hee, short attention span of mine). Momoko can balance Takeru's extreme personality and all. However some fans preferred Momoko and Kenta which I just didn't like. But this is just wishful thinking except for a few episodes. Sentai's Two Youngest Rangers- They're Children!